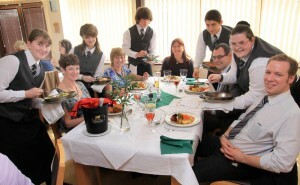 The annual lunch and dinners organised jointly between Tamworth Co-operative Society and South Staffs College are silver service occasions which help to perfect the skills of catering students. All proceeds from the events on May 16 and 17 will go to South Staffordshire Cruse, an organisation which helps families and individuals of all ages to deal with the pain of grief. The Co-op has already raised funds for the charity and is currently allowing it use of its main funeral premises in Upper Gungate. “The produce we give to the college is our own label and of very high quality,” said Bob Read, Tamworth Co-op’s senior general manager. The dinner costs just £16.50 per person with the lunch being priced at £11.50. Both meals will be served at the College’s Perry Croft Restaurant in the George Crook building, Croft Street, Tamworth. The dinner will begin at 6.30 pm with the lunch at 12.15pm the following day. The dinner starts with British country style fresh vegetable soup. A stuffed fillet of chicken en croute will then be followed by tender lamb noisette with orange and honey. Dessert consists of either apple meringue tart, strawberry choux with caramel sauce or raspberry sponge. Dinner will be rounded off with coffee and mints. The three-course lunch promises to be equally mouth-watering. The starter is salmon fishcakes with citrus mayonnaise on dressed rocket. A main course of chicken breast à la king (in a cream, sherry sauce with red pimento) will then be served with a selection of home-sourced seasonal vegetables. A choice of dessert will again finish with coffee and mints. For ticket information contact Maria Pursglove on 01827 63711 or contact Tamworth College on 01827 310202.